Dong-hoon basically got the shock of his life yesterday. He has been on the verge of crying this entire show, and maybe shed a few tears hear and there, but he actually broke down and wailed like a new born baby at the end of the last episode (or at least that’s what it sounded like since we didn’t actually see it fully). That scene and these actors are so amazing. MUSIC: OST #6 is released! Check the music List for OSTS and BGMs. KH looks at his van, DH sits on a bench and looks at the sky. He thinks back to the night his wife confessed. He is on the floor with his head on the ground and rocking back and forth as he asks his wife why she did that. He sits up and tells him wife that she is their kids mom. His brother asks him what happened to his hand, he says he injured it at work. Then it looks like he wants to tell his brother something, but he doesn’t. He says he may not be good enough for her, but he tried. Does she want to get divorced? Why with him? Can’t she tell people that are bad? You can divorce me and live with him so easily? What around our kid? If you thought about him you wouldn’t have destroyed his dad. Why, why, why! Dong hoon is t Jung-Hee’s, he is helping her do the dishes. Can he do it the way he wants to? Is detergent okay? As soon as you come home and do dishes and laundry and things. I couldn’t even watch TV sound because I just thought you were busy. I didnt’ even know you were having an affair with that guy, that’s why I cleaned the house and did whatever you asked me. Soccer team. The ajusshi’s are talking about there car. It is a guy car, not a woman car. You were the first in my life. You always talk about first. Our family, we are family, there is no rank. You are my first and I should be your first. But am I even second? You always think about your family. You always want to buy a van, we only have 3 people, why do we need a van? We eat together, the family all together, but I am not there, I am not part of that family. After giving birth, I went to your mother and helped her make kimchi. You are good to your mom so I tried to help her so you will like me. I was good to everyone of your family, even Jung-hee, but you were never on my side. The soccer team talks in front of Jung-hee’s. I hate this neaighborhood. All the people around you! The soccer team says goodbye. Don’t fight. Everyone leaves. People don’t know about that. How much you make the person next to you lonely. Brothers. Did you have an argument with your wife? DH – No, I didn’t. KH says he doens’t want to fight today at soccer, he will accumulate all of his anger and just do it and release everything on that guy. But if I release my anger then I will just accumulate everything, so tell me, what is going on. DH – just drive. KH-tell me. DH – I’m not your younger brother Inoma. KH – you never call me kindly, what happened? DH – I don’t have to tell you all my work stuff. KH – okay it is your work thing, okay. 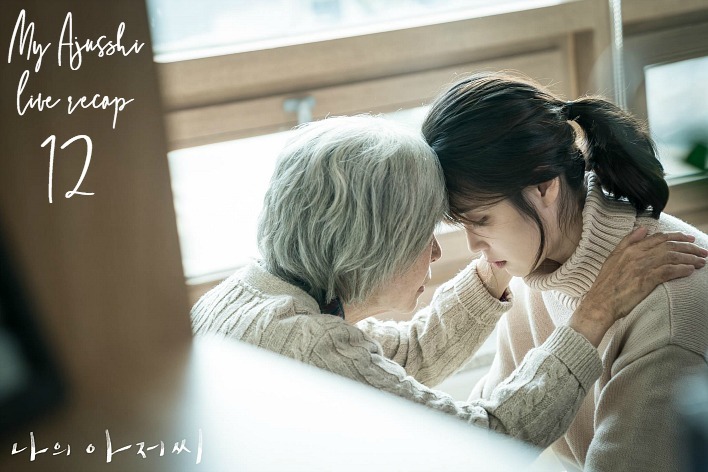 JA is at the hospital with her grandmother.She reads the note that her grandmother wrote for DH. Note – now I can die peacefully because someone like you is helping JA. Cut to DH at the soccer game. City wide soccer match. After I passed my bar exam, I wanted to leave this neighborhood, if we lived all by ourselves, then we can get better. But I stopped because whenever I brought it up, you stopped talking. I know you won’t forgive me, I know I am a sinner. When I found out that you knew everything, I wanted to die. What did I do? You were so pitiful so I wanted to die. The ajusshi’s practice soccer. The friend pours himself some coffee and some for SH and KH. He tellls them to drink it, it’s good for your body. They tell the friend to wake up DH. He wakes him up, it’s there turn soon. I know what you are most afraid of and waht you want to aoid. You don’t want to break up this marriage because of me at all (she is not the reason). You want to live quietly for your Umma and kids, I will agree with you. If you can’t stand it anymore and want to end our marriage, then I will do it. Whatever you say. DH – I don’t want to torture you to make my life less hard. We lived together for 20 years, how to finish it and dig it up, I don’t know who to do it, ……… it is too much for you and me. DH rides off in his brothers van, he just looks out the window. One of his friends motions “saranghae” to him from the next car. When it drives off, JA is standing there. She looks at DH and DH looks back at her. They both look sad and longing. DH works with his team and asks them what the sum is. They start talking about the work and different things about a particular building. The building has a lot of old things in it. They think the building will be angry if they get a C and not a D. The building owner wants to rebuild everything, but with a C they won’t be able to do it. DH tells them not to think politically about it. The meeting adjourns, they go back to their desks. It looks like DH training hotel was moved for security reasons, DH doesn’t think that is important he has more important things. They tell him to be there. Cut to him sitting at another hotel. They are railing into him about hitting JY. That is a big deal. Yoon and his team are also meeting to talk about DH and who to put up against him. OMG, they went to the same hotel! The elevator doors open and both teams look at each other. They all ride in the elevator together. The men grumble about how there are so many hotels and yet they meet like this. One of them laughs but Yoon tells him not to laugh. The man looks at himlike he wants to bit him. Everyone leaves in their expensive cars except the two candidates. DH and the other candidate bow to all the cars. Then they talk to each other in a friendly way. They ask each other how it is going. DH asks the young man who he thinks will be the next director. The young guy says he thinks it will be DH. DH says, thank you. It looks like that young man is also under DH because he uses banmal to him. DH’s team tells him that they will take care of everything. But DH shows up and a new song starts playing. It is a pretty happy environment. JA comes in and drops off something. One of the teammates says that JA is a little different. She actually answers questions now. He asked her if she works late and she said, yes. DH looks at JA working. Cut to them all running out of the building! They all take off running, JA is with them. Maybe it is the last train of the day? Yes, they are all running to catch their last subway trains. No one stops to say goodbye to anyone as they catch the train. Two didn’t make it, lol. But DH and JA make their train and it leaves. Dh tells JA she is good at running. Why is she working late? JA says he told her to get along with the other guys. Then she says that she wanted to see him. She says that he is looking at her like this, why is she still like this, I told her not to like me (?). Don’t worry, I am not going to show it, I know about the rumors about me in the company. So you are awkward with me now? DH – you, do you know why you like me? Because I ampitiful. Becaue you are pitiful. You are crying and hugging someone pitiful like me. JA – Why were you kind to me? It was the same right? We both pity ourselves. JA – I thought…we have a person taking pictures of us, didn’t you recognize it? The man walks through the room, DH looks at him. JA walks off and into the next car. The man follows, but doesn’t go into the next car. He sits in front of DH and checks his phone. DH – Excuse me, can I see your cell phone? The man leaves. DH follows him. he goes into the next car, DH follows. he goes into the car that JA is in. DH follows. They pass JA and he goes into the next car. DH doesn’t follow him there. he goes back to JA and stands next to her. But they don’t talk. They stand like that for a moment. DH and JA get to Jung-hee’s place together. Their friends tell him he is late, they are don’t for the day. DH introduces JA to them as his employee, they finished late so he is taking her home. JH is all like, DH really goes to work? He has a female employee. JA says she can walk home by herself. But Everyone wants to walk with her. JH is happy that she gets to walk far away from her building for once. So ther are a group of 7 people walking together. SH and one of the friends talks about how they never knew one of his female employees worked in the same area until he was fired. It means that people hate their superiors, they are all bad guys, bad managers. The other one says the female employee wants to walk alone, why won’t DH give her money to take a taxi. That is why they hate us. Sorry, we had alcohol. JH says that DH is safe. In their past, nothing happened to her when they searched for all the temples in Korea, how can nothing happen between men and women? We were in our 20’s. He is a bad guy, you knew where he was, but you dragged me here and there and everywhere. JH asks her if it is scary to be old like them. JA says she wants to be like them because her life will be less hard (when she is their age). Everyone stops and looks at her like she is a ghost. JH smiles and takes her arm and starts walking with her. Everyone falls in line behind them. They get to JA’s steps. Two friends leave to their house. So now 5 people walk up the steps. They talk about how one friend moved to another villa and gave SH some work to clean the apartment. Chubby guy said he never gave him work before. SH says it is because his wife likes him. They get to the place. they think it is a nice place, but they should change the door. they call to someone. A window opens. They know the ajusshi that lives across the way. They tell him to look out for this agasshi. He smiles and closes his window. Everyoen tells JA bye-bye. They starts walking down. JA tells them, thank you. DH is surprised to hear that. But everyone else just smiles. DH tells her, if something happens, then call that guy. He leaves. They all walk down the steps. One of the friends went his way. So now it is three people walking. JH says that when she thinks that way….when she was young, life was hard also. JH walks in the middle of SH and DH. KH monitors YR’s acting. He is sitting with a woman. The woman says YR was okay at first, but later…. KH looks at all the computer images of YR acting. Then we cut to the actual set. The director yells cut. Then he asks her why she did it that way. Do it again. In the room, the woman says she is getting worse and worse, look at her. KH watches her do the scene again. Then we cut to KH and the woman afterward. They should go see the director. KH is sad because that director is just like how he was. The woman asks if he is going there to hit that director, you said you are going to kill him. KH drives off. He doesnt’ go there. YR shows up to the cleaning company again. She asks KH to just kidnap her, it is embarrassing to quit. She doesnt’ want to be a quitter, jsut for 6 months, can he just kidnap her and keep it a secret? He asks her if she would like to clean with him? She can come there and marry him? Wouldnt’ it be scary? She says that she doenst’ care if he kidnaps her. He tells her to just fight. But she just keeps says that he should kidnap her, does she know how her heart runs now? KH tells her to quit. One time is okay, but the second time is her problem, your heart is that small, you are not ready to get yelled at, but you want to be a big star. Just leave, don’t come here anymore, you just cry at someone elses workplace and ruin my mood. KH gets in the truck. SH looks conflicted as he stands outside the truck watching YR walk away. He gets in and tells KH that he wanted to see her so much, bad guy. KH tells him to just leave. YR walks away slowly with tears falling. The truck drives past her. The friend sees all the pictures on the inspection homepage. JA tells him to erase them. He says someone will upload them over and over again until someone sees it. He asks how long, she says to just wait. JA looks at DH talking to his teammate. His teammate says it is an honor to go to the meeting that will make DH a director. JA calls DH’s wife. YH looks at her phone, she also saved JA’s number into her phone. She looks at it. Wang and Wang2 talk with JY at the hospital. They talk about doing a little bit and finding the answer easily. JY says there is no seniority. It is ability. If they pick based on ability then DH will be the one. It looks like JY misunderstood. HY meets with JY on the rooftop. She says that if she tells them what he didn with that girl, then he will be done. Just stop here, it is so embarrassing that I likes someone like you. he says he wanted to marry her. She says F-you, you didnt’w ant to marry me, it is all your greediness. They argue abck and forth. YH tells him to stop messing with DH. She is already destroyed by him, but she won’t let himd estroy DH also. JA walks up. YH says she called her to make sure. She tells JA to stop. JA says, if she stops then DH will be in trouble. She already started something. YH thinks JA might have slept with DH. JA thinks that is funny since she already did everything (with JY). YH says she will tell everyone in the company that she had an affair with her and talk about what he wanted JA to do. JA says she already spent all his money, waht should she do. She says she will quit publicly and leaves. YH doenst’ know what thae means. But then YH and DH start arguing again. YH says she will divorce him anyway. It is hell for both of them. She will divorce him because of her, not because of him. DH just hates you. I am going to wait until that point were DH thinks he is divorcing because of me, not because of you. That is all that I can do for DH. That is the price I have to pay for stupidly liking you and betraying DH. JY asks her why women like DH. Do you think about why JA approached DH for work? She also tricked me. he leaves. He hops in the car and tells someone to tell the inspection team not to release any of the reports, it is there chairmans order. YH is int he car, it looks like it was JA and YH’s plan to stop JY. YH asks JA if she really likes DH. on the phone. JA says yes. YH thanks her for calling her first. They both hang up. JA is walking outside. YH starts crying in her car. GI asks JA where she hid her halmoni. She says they don’t have any business anymore. JA says that he is trash just like his father. He is making excuses to see her. The man opens his window. GI says he hit her because he hates her, not because he misses her. You killed my father and didn’t say sorry. Of course I hate you. JA asks him if he feels happy (hitting her). GI tells her that the way there is just like the hill he took her to when she was unconcious when his father hit her. My heart was going here and there, should I jsut kill you or should I just die. GI cries. Umma asks SH about his brothers promotion and they basically talk about that. Umma thinks that something is going on but the brothers aren’t telling her. Umma goes to Jung-hee’s. She thinks something is going on with DH, when she talked to him, he didn’t sound happy. Jung-hee says nothing is happening. They start to talk about KH and how he has a woman. Umma is curious, is she strange? JH says she fits well with KH. The brothers are ont eh job cleaning. There is about to be a red light. Sh tries to make it, but it turns red. He slams on the breaks and the car almost flips over. KH is so mad, he hops out of the car in a rage and says he wants to see the director! Directo Ahn! KH visits the director, they are all eating out. He sits next to him. KH – really, I was just, maybe maybe, I didnt’ know there was someone like me. Can I hug you once? I want to cry because I feel like I see myself…..yelling and mocking the gurl, I know why you are doing that….you know that girls acting….Iknow everything! You and me know how bad you are….you know your senario is bad! You think that you failed…..JUST SHOOT THE MOVIE, DON’T YELL AT THE ACTOR. They get into a fight. JH – Ten years ago, the movie I shot with you. I realized that it was a bad movie and will be a failure. I won’t come back to movies at all. I just became a genius by coincidence. But I wanted to be a genius, I wanted to remain as a genius, if I just don’t shoot a movie and die. That is why I wanted to blame you. When I yelled at you more and more. When you where scared and you became worse, i was happy. Break more, break more. Then this movie just failed. Not because of me, but because of her, that is why this movie was bad. After we shot half the movie, when the producer said to just quit the movie, I was relieved. This guy…we know who we can break. you were picked by that guy as a sacrifice for him. Why did you pick him there. You have to figh against him, bite him! If you were angry at me before, then I wouldn’t be like this. After I did that, I hated myself. I was just…punishing myself, this bad guy. that is why my life is broken adn why I am here now. YR – This doesnt’ make senses, Are you blaming me now. KH – From now on, just kill everyone that yells at you. I will have your back. KH leaves. YR starts crying. KH walks out of the building. YR still cries in her room. KH says he watched A BETTER TOMORROW and CHOI YANG FAT movies all the time. He says he hates himself. SH says he just likes himself. KH says, that is why I like you. YR shows up to Jung-hee’s in her pajamas. She is still crying and angry. She storms to KH. Everyone looks at her. She pushes KH into the wall and cries into his chest. Everyone tells him to pat her back. KH doesnt’ know what to do. The moment is so awkward. KH goes outside with YR. They both say, if you dump me first, I will kill you. KH says he is a cleaner, of course she will dump him first….don’t dump me first. She says we shouldn’t dump each other..promise. They pinky promise. So now they are dating. YR – marriage, maybe it is difficult. KH – I am not that bad of a guy. She rests her head on his shoulder, he pushes her away. She puts it back. He pushes her away and says why do you do this. Shelaughs and puts it back. Inside, everyone is talking about them. SH says there is not start, middle begining with men and women. JH says that actually, men and women start and end at the same time. She feels like this is not the end (but maybe she is talking about herself?). KH runs home and tells his mother that he has a girlfriend now. She tells him that he brought the lunch box (?). DH shows up to Jung-hee’s. All the friends fill him in on what happened with his brother and the actress. She pushed him to the wall and he held her and cried! But then there is a phone call inside for DH. It is the monk. JH picks it up and looks at it. His name is Gyum-duk. The monk left a text. monk: A lonely pen in my room. It looks like I am looking at you, are you sleeping?…(she answers, drinking)….with company people?…..(no with Jung-hee, do you think of Jung-hee at all? )……..no, I saw her when I dropped you off. She looked the same. Jung-hee goes to the bathroom and cries. All the suits go into the big meeting room. Yoon tells them to say anything, they are good at talking bad about their superiors. the meeting is called to order. This is for the vote. The main person tells them to try to be fair. Yoon scratches out something on the paper. It looks like they picked Lee Ji-ahn as an interviewee. One of the other men is furious at this. Someone goes and gets Lee Ji-ahn and takes her into the room. DH walks into the teammates space. One of them wants to tell him what just happened. All the teammembers look concerned about it. Cut to JA sitting at one end of the very long desk. JA – I was just unseen at work becasue people always mocked me. DH was the first person to tell me to join the meeting. DH didn’t discriminte against me because I am part-time. Suit – That is why you liked him? JA – (long pause) Yes. Everyone grumbles on the good guy side. JA – I like him. I respect him. JA – I didnt’ expect anything becasue I was just sent. I didnt’ try hard at all. But now, I want to work hard. Wang2 walks into the room. JA looks at him and looks nervous? Everyone stands to greet him. He tells them to sit. JA – I like someone, but I don’t know if someone points a finger at me, but if I get fired today, I was treated as a human for the first time. Maybe I can be a better person. I can be a worthy person. I will thank the company and thank Park Dong-hoon. I worked here for 3 months. It was the warmest time in the 21 years of my life. I felt good when I saw this building. Forever, I will hope this company does well. DH sits at his desk, concerned. The company people all look at each other. Yoon – So how far did you go? JA – Home. We live in the same neighborhood. The good guys are concerned. JA leaves the conference room and walks back around to her desk. She sits down. Everyone looks at her expecting something. But she gives them nothing. DH’s guy walks in, he is happy. He tells him to come over here. they go into a room. Man – JA is smart and well spoken, good job. Everything went well. All the company men leave. Wang2 – Tell Park Dong-hoon that I will really buy him dinner. Dong-hoon and JA sit for dinner at the friends cafe. DH – You are brave. JA takes a sip of her beer. DH – But I am not that good of a guy. DH smiles and laughs as well. At the cafe, DH and JA quietly drink together. This is the first time someone did good to him more than 4 times if we meet, will you be nice to me? I actually posted early enough to relax a little bit today 🙂 . I hope your Korea trip went well! This drama give me all the feels…I cried so much at the end of episode 11. Looks like our separation/time lapse is coming! thanks bah+doo. as depressingly as this may be! Hopefully things will be looking up for our leads in the episodes to come! hi hi hi.. i wanna say thanks in advance!! your blog really helps fans who don’t understand koran but can’t wait sub as well.. hehehehe. This episode had better end on a satisfying note because the wait till episode 13 would be agonizingly long as production has just announced they are taking a week off to give everyone a break. On the other note, really good job with the live recap. I don’t know what to do after this drama ends later because I’ve been so looking forward to your live recap every week!